The third stage was a very good stage for Indiaá Hero MotoSports’s Spanish debutant rider Oriol Mena, who overcame tough navigation to clock-in a fast time today and finish the stage at 13th place. During the stage, he also stopped for a few minutes to help a fellow competitor who crashed in front of him. This may result in a time refund, which will further improve his rankings. By finishing the stage at 13th place, Mena also broke into the top 20 in overall rankings at the 20th position, pending the time refund decision. "First really difficult stage with tough navigation," said Mena. "I stopped for a few minutes at 50 km to help No. 17 who got knocked out due to a crash in front of me. After that I managed to get my concentration again and made up good speed to arrive home in quick time. I am quite happy with my day and enjoying my experience out there!" On the other hand, CS Santosh lost a lot of time as he ran out of fuel, 30 km short of finish, due to a loose fuel cap. 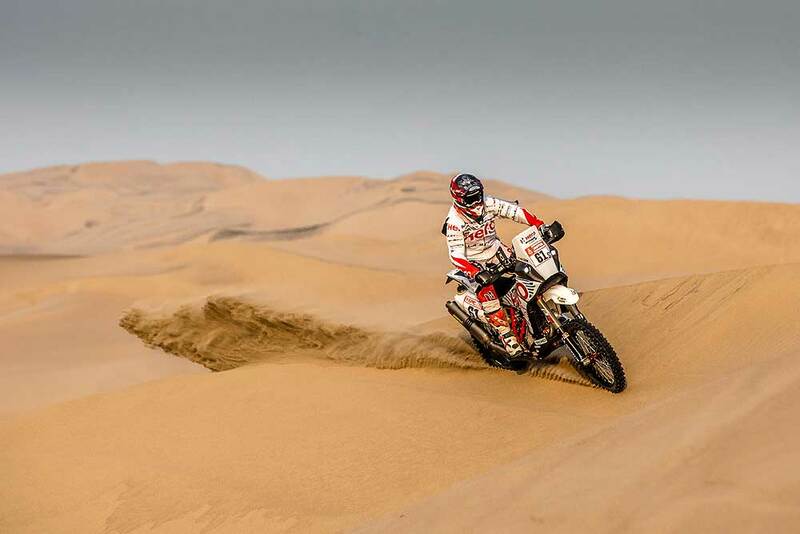 As a result, he slipped down in the rankings, closing the Stage 3 at 101st position and overall at 57th. With 9 more stages pending, he will aim to make up for as much lost time as possible. "I started with a good rhythm today, then went on with the flow in the 2nd part of the stage," Santsoh reported. "I had no issues with the navigation as well. Unlucky for me, the rear tank cap was not closed properly after refuelling and I lost my rear tank fuel before I realized it. Finally, ran out of fuel 30 km short of the finish and had to wait and ask for the fuel from some of the slower riders coming at the back. In the process I lost over an hour’s time today. It was not the best day, but I take the positive that I am still in the race and that’s what counts."